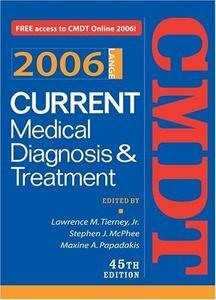 Concise, Authoritative Answers on Every Aspect of Inpatient and Outpatient Care! Includes free access to CMDT online, a $79(U.S.) value! Now celebrating 45 years, CMDT delivers authoritative, timely coverage of more than 1,000 common diseases and disorders along with a clear synopsis of treatment and diagnosis. 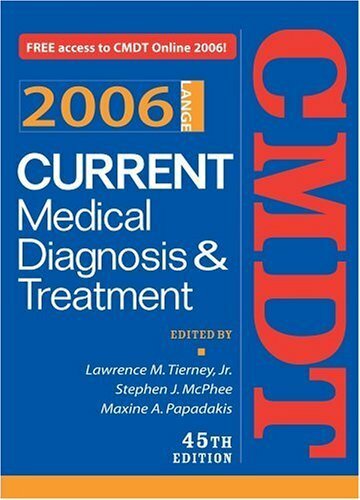 Utilizing a "find it now" format and made even more accessible by a detailed index, CMDT covers almost every aspect of general medicine with an emphasis on practical clinical diagnosis and patient management. Within its pages, readers will find a meticulous presentation of every major primary care topic, including: gynecology, ophthalmology, psychiatry, neurology, obstetrics, dermatology, otolaryngology, toxicology, and urology – all from one of the world's most respected editorial boards. Get print PLUS online FREE and save $79.00. This special 45th Anniversary limited edition features a full-year subscription to CMDT Online.